When I decided to involve other writers in the proposal for this project, Kyra Calvert’s voice was one of the ones, I had on a short list of people I’d really like to contribute, not because she’s a big famous name in any of the twin cities writing scenes just yet, but because she has a voice that deserves to be listened to- and because I hadn’t heard it in a while. There will always be reluctant artists, through insecurity, disinterest, distraction, or the belief that a human must follow a certain course of achievements in order to have paid their dues. I don’t presume to know what Kyra has been up to, but I’m glad to reached out to her and you’ll be glad you listened to her. 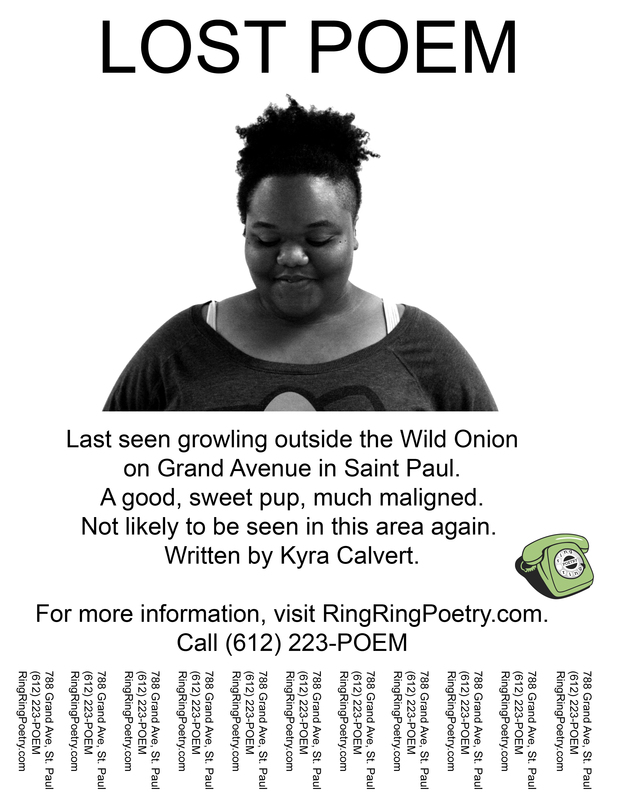 Kyra brings something that you won’t hear in the other poems of Ring Ring- a poem less in love with its location. Why should we assume that every place in the Twin Cities deserves odes? Kyra reads with great emotion, and tells a uneasy story without a moral, or a neat bow to tie it all together gently and sweetly. You owe it to yourself to listen to this beautiful, uncomfortable piece. 612 223-POEM.